This release improves the logic of some scan checks that depend upon the content type of responses. Burp has previously reported content type incorrectly stated on any occasion where the stated content type of a response differs from the actual content (as determined by Burp). This has frequently led to a lot of noise because (a) Burp's own content type sniffing has not been perfect; and (b) many content type mismatches have no security implications. Hence, many users got accustomed to just ignoring this issue, despite the fact that, in some rare situations, it can lead to high-severity issues like cross-site scripting. 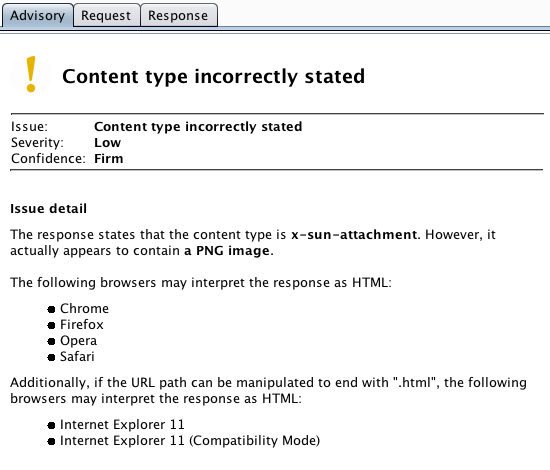 The cases where this issue matters occur when a response is intended to actually contain non-HTML content such as an image, but a browser may attempt to interpret the response as HTML based on the stated content type. This can lead to XSS if the content is dynamically generated, uploaded by a user, or otherwise contains user input. 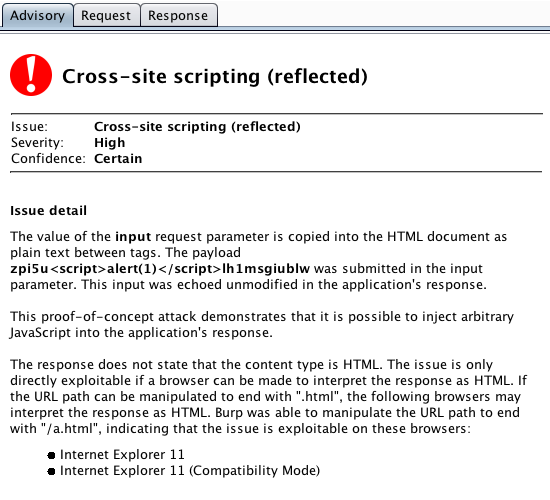 Burp now uses its knowledge of actual browser behavior (based on the factors listed above) to determine whether any browser might attempt to interpret a response as HTML. If content sniffing depends on the request URL having a different file extension, Burp will attempt to manipulate the extension so as to trigger this. Any relevant details about specific browsers' behavior is included in the issue detail. Seemingly unexploitable issues are still reported as informational, because a manual tester might nonetheless be able to find a way to exploit them. Unrelatedly, the configuration of client SSL protocols and ciphers has been modified to include a master toggle specifying whether to use the default protocols and ciphers of the Java installation. This is the new default option, and can be overridden to allow configuration of specific protocols and ciphers. This change simplifies the configuration UI and makes it easier to share Burp configurations between different machines.